Beef up on a budget with bavette, an undervalued cut that's big on flavour. 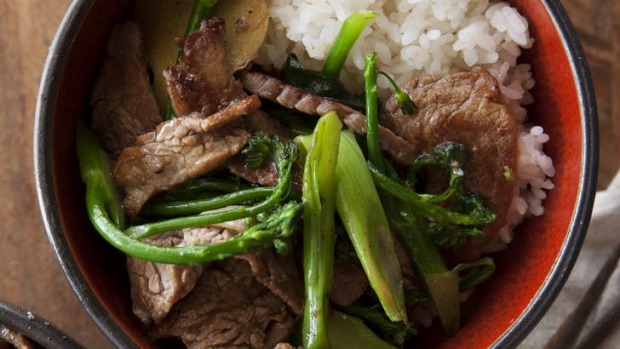 Sliced against the grain, bavette (or use skirt steak) is among the best meat cuts for wok-frying. Here, the strong, beefy flavour is lifted with oyster sauce and matched with broccolini, one of my favourite vegetables for wok cooking. At $2.88 a serve (yes, I costed it) this meal is great value, quick and delicious. 1. Combine the beef with the meat marinade ingredients and marinate for at least 10 minutes. 2. Heat about a cup of water in the wok until boiling, add dash of oil and blanche the broccolini for about 1 one minute until it is bright green and slightly softened. Drain and set aside until ready to fry. 3. Drain the water from the wok and dry the wok over the flame. Add about 2 tbsp oil. Add the ginger, then the garlic to the oil, then the spring onion and fry until it is softened. Scoop the onion, ginger and garlic out of the oil and add to the broccolini. 4. Using the flavoured oil left in the wok, fry the beef in batches until well browned. Return all the other ingredients to the wok and toss together. 5. Add the oyster sauce, soy sauce, stock, water and and sugar and toss to coat. 6. Slowly drizzle the cornflour mixture into the wok while tossing until the liquids thicken and cling to the ingredients. 7. Immediately remove to a plate, rest for a moment and then serve.